Gallery of emotions and facial symbols as patterns. Physiognomic symbols in this gallery show logic combinations of facial features which are figures of human emotions, and actually can be applied as template images or model patterns for visual choice of emotional images for art design of cosmetic make-up. 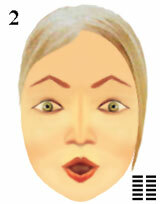 Facial features express absolute or uniform open emotions. The person comprehends all-embracing or entire completeness of world around. Absolute desires of the person are carried out. physiognomic symbols of a face as cosmetic patterns.